The Handbook of Oregon Birds (2009) by Herlyn and Contreras has this to say: "Rare to sometimes abundant visitor to the offshore waters of the [northeast] Pacific.... occasionally seen onshore in winter and spring." So, far offshore larger numbers of birds may occur in certain years. But the birds generally occur farther offshore than most traditional pelagic trips, and at seasons where there are fewer pelagic trips scheduled. You might say that the bird itself might not be all that rare in Oregon's offshore waters, but it is rarely seen. However, also occasionally, a Horned Puffin will be found in summer amid breeding Tufted Puffins on the Oregon coast, but they do not breed in Oregon. So if you wait long enough, and do lots of seawatches, you will possibly see one of these birds from shore in Oregon. April 4, 1998, on a 20-hour trip where we got on the boat at night and were 60 miles offshore from Depoe Bay at dawn, we encountered 2 birds. March 27, 2007 we encountered 7 live and 2 dead Horned Puffins 15-33 miles offshore from Newport. This followed unprecedented numbers of dead puffins (150+) washing up on Oregon's beaches during the winter/spring. August 16, 2008 there was a bird just off the jetties at Newport. February 21, 2009 a couple of people spotted a bird flying away from the boat about 8 miles offshore. May 5, 2012 one bird 28 miles offshore from Newport. 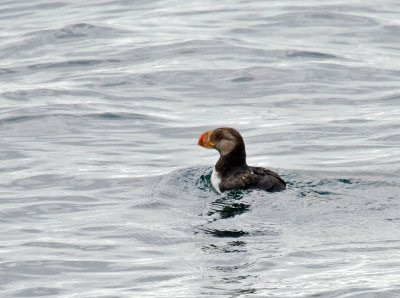 So it is possible to see Horned Puffins on winter or spring pelagic trips from Oregon, especially if the trips travel well beyond 30 miles from shore. But it's not very likely. This species remains one of Oregon's rarer pelagic birds.